If you are a person who stutters you're a covert stutterer. Here's why. Fear of speech, hiding stuttering, and pretending to be fluent is a big part of stuttering. For us, for people who stutter, it is stuttering actually. Other people see stuttering as our speech impediments. We see stuttering through the lens of fear of speaking, and avoidance behaviors. That's the inside of stuttering, that's what we see, that's what we feel. We are masters of that. At some point or another we all find ourselves in avoidance behaviors, we didn't do what we wanted to do, we didn't say what we wanted to say. That is stuttering. Usually, fear of speech, hiding my impediments and not doing what we want to do, not saying what we want to say - they just go hand-in-hand, it's more or less the same thing. We give in to our fear. Sooner or later, we get sick of that. We realize at some point that we don't want to live like that our entire life. At some point or another, it strikes us that we want to live freely. This is not the right way. We want to stop being a slave to that blackmailer. Because stuttering is like a blackmailer who knows a "secret" about us, some bad truth we don't want anyone to know. Stuttering says “Don’t do it, or I’ll tell everybody the truth.” And we follow its instructions, we keep going this way, but we're always ready for a rebellion against that bad ruler, against that bad guy. There are 2 ways out. So the first option (overt stuttering) is to tell everyone the truth. The blackmailer goes like “What? You told them the truth?” You say, "Yeah, I told everyone the truth." The blackmailer is losing all his power. It’s fast. A great way. The downside of this is that the blackmailer can come up tomorrow, the next time we meet new people or get into new settings. So we need to go through this again and again. We might have a strong temptation to fall back to a covert box which seems so safe and secure. I’m not a great expert in that “overt stuttering” thing. I’ve met some awesome people at National Stuttering Association Conference who were very open about their stuttering. I was truly amazed. I still want to know more about it. 2. Finding a way how to stop stuttering. I’m more about the second option, about finding ways how to stop stuttering. For me getting free from stuttering involved a period of training speech which was slower than my usual speech. It makes you totally open not only about your stuttering but also about your effort to stop stuttering. Which for me meant being double-open, double-overt. So for me, the second option included the first one. The second option was also helpful to me personally because it gave me additional encouragement why I should get out of my shell – because I'm getting free from stuttering. It gave me an additional reason why I was doing it. Again, I respect both ways. Both options are brave, daring, and courageous. 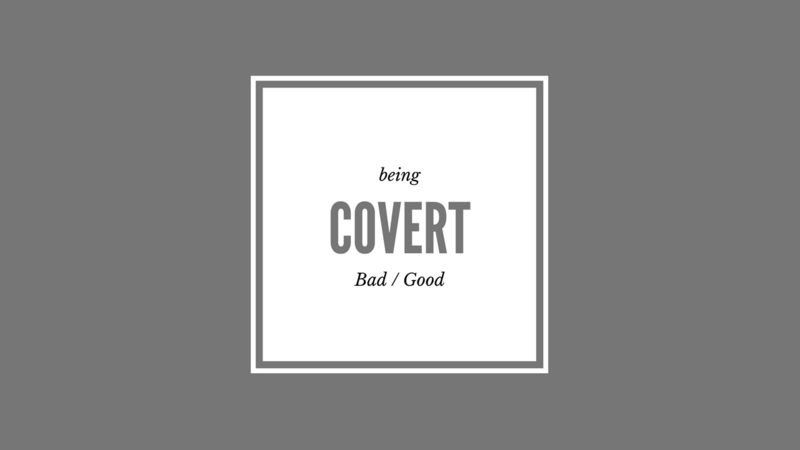 Now let’s come back to being covert. Is it bad or good? I would say it's three things. First, it’s obviously bad. Our life is guided from the place of fear, from what we should not do, not from a place of abundance and possibilities. That’s a bad thing. Second, it’s good. “Why and how in the world it might be good?” you’re asking. Well, as long as I stay covert I still believe, I hold on, I hope, I search for fluency. I have a potential to get free from stuttering completely. I have a potential to go either way. I have an opportunity to choose any of those options. When we choose acceptance (I’m not a great expert in that, but that is my observation) we find it liberating in the way we feel about it, we usually feel some improvement in our fluency as well. But most of the time by choosing the first option we close the door for the second option, for getting free from stuttering. There're 2 objective reasons for that. 1. We stutter more, so on a physical level, we accumulate all those stuttering experiences into our muscle memory. Our automated stuttering speaking pattern becomes stronger, we get deeper into that. 2. On an emotional level, we desensitize stuttering, and we don't feel that bad about it anymore. That's a good thing but that's why we kind of don't need to change anything dramatically. We agree with ourselves that this is fine. And the third answer - it’s just natural. It’s in our guts the desire to be safe. We don’t want to be exposed to negative feeling and emotions. That’s totally natural. That’s totally OK. And again, every person who stutters has found itself there. No doubt. My wish to you is that you don’t stay there too long. Life is short, don’t put it off. You have something to accomplish in your life, you can’t do it while sitting in the shell. And getting outside the shell means either acceptance or finding ways how to stop stuttering. Both ways are courageous. Both ways are a hero’s journey. Both ways are something we can be proud of. So, covert stuttering - is it bad or good? What do you think? Leave a comment below.